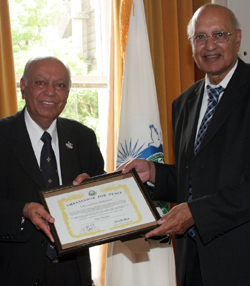 Dr Hari Shukla OBE was presented with an Ambassador for Peace award by Lord King of West Bromwich on July 3rd during the UPF Peace Council in London. 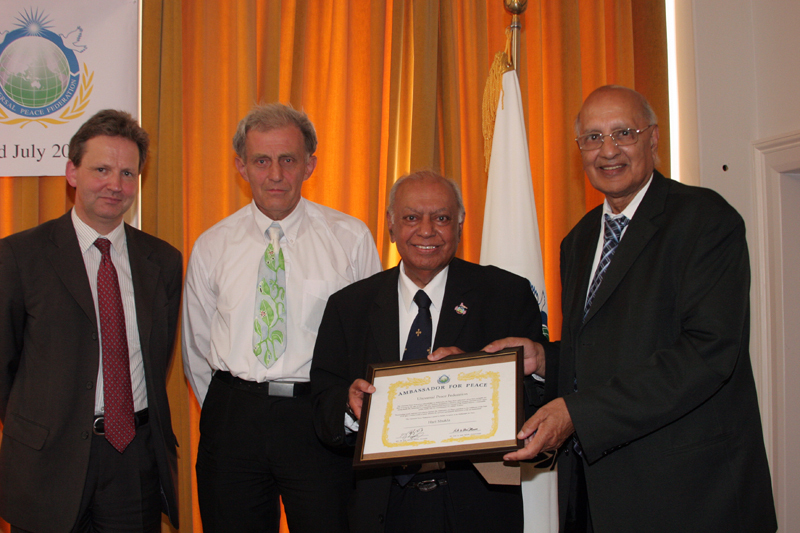 Dr Shukla has pioneered the 'City of Peace' movement in Newcastle in a lifetime of community cohesion activities. The “Newcastle - City for Peace” was launched in May 2008 with the backing of a wide range of agencies and individuals in the city. to tackle prejudice, create a positive and safe environment, reduce tensions and promote good citizenship. Dr Hari Shukla is the former Director of Tyne & Wear Racial Equality Council. He has been made a Freeman of the City of Newcastle and has been awarded an OBE. Once again it gives me great pleasure in writing a message about Newcastle City for Peace initiative. As more and more groups and organisations are becoming involved in the initiative, it is important that understanding what this initiative is all about and why we need it more than ever before. Newcastle is described as a global village. People from 152 countries have made Newcastle their home. Therefore it is our responsibility to create space for everyone so that all live in peace and develop a sense of belongingness. The first requirement for all of us is to regard our city as our home. There are many who treat it as a hotel. That means when we go on holiday we stay in a hotel whilst we stay there we don't worry about the place and if there is something wrong we will not bother about it, thinking that it is not our responsibility. So when we live in a city, we accept it as our home and we should concern ourselves for everything that happens in the city. We need to establish 'new city order'. In order to achieve that, we need to develop discipline in life. A disciplined city is aware of the obstacles that exist among the people. These obstacles should be discussed in the open and support of the general public should be mobilised to tackle these problems. At a time of recession, it is more important that all citizens come forward to play their part, however small it may be to encourage people to share with those who need help. Every effort should be made to help individuals to bring out the best and help them to put it to better use in the benefit of all. Dialogue is a key to making people understand how people from different sections of our community feels. Efforts should be made to develop lines of communication with all people. As we progress through the year we hope to walk towards creating "a new city order".